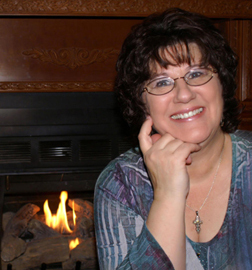 I am very excited to introduce you to our first author on Write to the Point, Delia Latham. I am sure you will find her interview as interesting as I did. Read to the end so you can enter to win a free book. Now, let’s get write to the point with Delia. Tell us about yourself, family? I’m a mother of four, grandmother of four, and I’ve been married to Johnny for nearly four decades (well, 38 years…that’s pretty close). I’m a born-and-raised California gal, transplanted to Oklahoma three and a half years ago. I love my Lord, my family, and Dr. Pepper in the morning. My parents found Christ when I was six, and I received the infilling of the Holy Ghost at seven in a little church pastored by my uncle, in a small farming community called Weedpatch. Gypsy Lovell stands to inherit an enormous amount of money from a father who never gave her anything but a ridiculous name. Even now, he doesn’t make it easy. A stipulation in the man’s will demands that Gypsy be married in order to claim what is hers. Desperate for the monetary windfall that could save her ailing mother’s life, Gypsy visits a Christian dating agency, hoping to find a temporary husband. Someone easy to handle for the required six months, and easy to get rid of when she no longer needs him. Jal Garridan is neither of those things, but he’s willing to take on the challenge presented by the beautiful stranger—on his own terms. 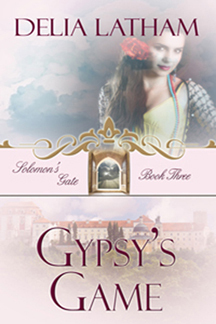 What Gypsy doesn’t know is that Solomon’s Gate is a dating agency with a Divine connection. What she finds there may save more than her mother’s life. It may save Gypsy’s soul. I’m going to claim the woman’s prerogative to be indecisive. LOL I am completely incapable of choosing a favorite book. I love to read, and there are so many wonderful authors out there. How about I share a couple of books I’ve read recently that I especially liked? I love short reads (novelettes?) because they provide a satisfying story and a brief reprieve from life, but don’t keep me from my own writing for long periods at a time. I very much enjoyed Marianne Evans’ A Face in the Clouds and E.A. West’s The Key to Charlotte. Pamela S. Thibodeaux’s The Visionary gave me goosebumps—in the very best way. Loved Mary DeMuth’s Watching the Tree Limbs. And any book by Vickie McDonough or Mary Conneally leaves me smiling. I could go on, but I wouldn’t want to keep you here all day. The focus of this blog is Genesis 50:20. Can you share a Genesis 5020 from you life? I’ve always loved to sing. Sang my first solo at about seven years old, standing up on a chair my pastor placed behind the podium at our church. I was always part of the music ministry as a young woman, and even after I married. Then there came the time that I drifted away from God and began to use the talent He gave me in ways that brought Him no edification. I was the band leader in a country western band, and so caught up in being lauded and praised and admired that I was destroying my marriage and my relationship with my children. A couple of trips to Nashville had promising results, and it seemed a career in country music would be a given. Then I got pneumonia. A bad case of it, to the extent that I was hospitalized, and the doctors informed me that I had asthma. Soon after being released from the hospital, I began to fear that I would never again have the breath to sing. I cried and stewed and ranted and raved, but my fears proved to be true, to a degree. Even after I recovered from that episode, I could never manage more than a few songs one after the other. I no longer had the vocal stamina or sufficient lung capacity to sing professionally. Now I can sing just enough to do so for the glory of God. But my marriage survived. I have wonderful relationships with each of my four children. I’m back in the Shepherd’s fold…and God gave me a new career using another talent He gave me…writing. So the devil loses yet again. Ain’t God good? What a great story. I especially love hearing how God reclaims marriages. Thanks for sharing that with us. God is good. My daily prayer is Psalm 51:10 – Create in me a clean heart, O God; and renew a right spirit within me. And I love Philippians 4:8 for it’s simple and profound instruction as to exactly where our thoughts should be…all the time: Finally, brethren, whatsoever things are true, whatsoever things are honest, whatsoever things are just, whatsoever things are pure, whatsoever things are lovely, whatsoever things are of good report; if there be any virtue, and if there be any praise, think on these things. Thank you so much Delia for sharing with us. I appreciate you taking the time out of your schedule to let my readers get to know you. Readers, all you have to do is leave a comment. Tell me what book you would choose from the Solomon’s Gate series if you won, then your name will be entered in the drawing. Make sure I have your email. You can choose from any of the books in Delia’s Solomon’s Gate series and she will send you a PDF of the book of your choice. The deadline to enter is March 20 at 5:00. Any comments after that will not be entered in the drawing. I enjoy Delia’s books. If I had to choose, I would like Destiny’s Dream, as it’s the first in the series. Thanks for stopping by. All of Delia’s book sound great and the covers are beautiful. Melissa, I am so very honored to be the first author interview on your beautiful blog! I love the concept you’ve built it around (Genesis 50:20). Looking forward to getting acquainted with your blog visitors. Thank you Delia. I loved hearing your Genesis 50:20, especially because I am a music person too. Delia Latham is a great inspirational author and it would be hard to choose any author that can top her!!! # 1 in my books!!!! Sis. Brenda, thank you for your constant support and endless positivity! Love and appreciate you. Delia, thanks for sharing your story. I am wondering, how/why did you end up in Oklahoma after living so many years in California? The idea of a temporary husband sounds intriguing! So I would choose Gypsy’s Game. Unless it makes sense to read them in order, then I would go with the first one in the series, Destiny’s Dream. Each of the Solomon’s Gate books can stand alone, but characters from each of the two previous books show up in the later ones, so it’s fun to have read them in order and see those familiar “faces.” It’s like running into someone you love, but haven’t seen in a long time. Heidi, I am so glad you checked things out and made a comment. It’s nice to see you here! Wow, Delia, all I can say is, “To God be the glory.” We have walked in the same shoes at times. God bless you! Actually, He already has. Thanks for commenting Nancy. I like to read things in order too! I always enjoy learning more about authors and the books they write. This series sounds very intriguing. I would probably pick the first in the series because I’m a “read the books in order” kind of gal! Can’t wait to hear about more great books and authors Melissa! Hey Jolene, thanks for commenting and joining in the fun!